The Asian honey bee (AHB), Apis cerana, is found throughout the tropical, sub-tropical and temperate zones of south-east and mainland Asia. This wide distribution has led to variations, commonly known as genotypes or strains, particularly between the temperate and tropical AHB. Although there are numerous strains or genotypes of Apis cerana, the information on this page focusses on the AHB that is present in Cairns (Queensland), which is the Apis cerana Java genotype. This is a tropical strain of AHB and most likely arrived in Cairns in 2008 via a ship from Papua New Guinea or Indonesian Papua. This genotype cannot be managed for honey production and pollination services due to its frequent swarming and tendency to abscond. The AHB produces less honey than the European honey bee (EHB), Apis mellifera, and in other regions where this bee has established, it has shown the ability to rob the EHB of their honey stores. As a cavity nesting bee which is capable of nesting in smaller areas than the EHB, the AHB also has the potential to become a competitor for nectar, pollen and nesting sites in the natural environment, as well as nest in urban environments. 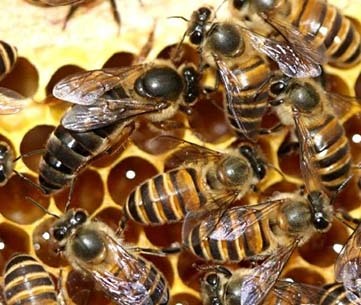 The majority of the information contained on this pest page was developed by Biosecurity Queensland during the Asian Honey Bee Transition to Management Program. The mites detected on Asian honey bees in July 2016 in Townsville are Varroa jacobsoni, not Varroa destructor. For more information about varroa mites and how to check your hives go to the ‘Varroa mites’ page. If you see any unusual bees, or pests of bees, call the Exotic Plant Pest Hotline 1800 084 881. AHB fly very quickly and erratically while feeding on floral resources, while EHB forage much more slowly and methodically. The thorax and abdomen of AHB have less hair than those of EHB. AHB have more prominent, evenly spaced and consistent abdominal striping, compared with EHB that tend to have uneven abdominal striping. EHB generally have thicker black stripes towards the back of the abdomen, making it appear more yellow at the front and darker at the end. AHB differs from EHB by having a distal abscissa of vein M in the hind wing when viewed using a microscope. A swarm is a group of bees searching for a new nesting site and can vary in size from hundreds to thousands of bees. 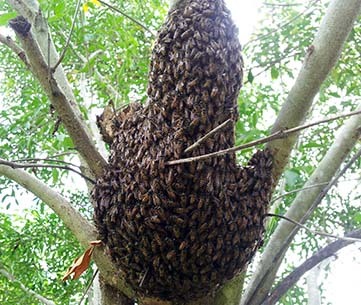 Swarms can be found flying or hanging from objects such as tree branches, house gutters and fences as a dense cluster around a queen. Swarms may remain in place from a few hours up to one to two days while they send out scout bees to find a suitable nest site. Once a suitable site has been located, the queen will move with the swarm to the site and establish a nest. Swarming bees are not normally aggressive as they are homeless, which reduces their defensive behaviour. A nest is a permanent colony of bees that is usually concealed within a cavity, such as a tree hollow, roof, wall vent or discarded mechanical equipment. The entrance to a nest can vary in size depending on where it is – it may be a small crack such as a building crevice or a larger hole entering a tree hollow. There will be consistent movement of bees in and out of the entrance to the nest. Nesting bees will defend their nests and queen, and are more aggressive and likely to sting if feeling threatened. AHB swarms can range in size from that of a closed hand to that of a basketball; EHB swarms are generally much larger. AHB swarms generally appear orderly with bees uniformly arranged and facing the same direction; EHB swarms tend to be unstructured. AHB very rarely assemble around the nest entrance; EHB often linger in numbers on the landing platform. AHB approach the nest and entrance swiftly and often fly directly into the cavity when returning with pollen and nectar; EHB approach the nest at a more relaxed pace. AHB nest in relatively undisturbed cavities in and around human dwellings, making human encounters more likely; EHB prefer to nest in more open and less disturbed environments. A unique feature used to confirm the identity of AHB nests are drone brood cells. These cells are constructed differently to the comb of any other bee species and have a raised wax cap with a distinct pin hole sized pore at the top of the cell which becomes prominent within a week of the drone emerging from the cell. 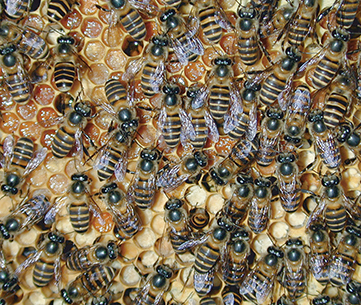 Beekeepers should look for AHB nests and swarms. 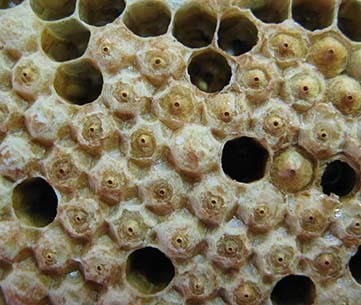 The AHB is a cavity nesting honey bee and therefore prefers enclosed openings such as tree hollows. The AHB can also swarm and nest in urban and disturbed environments. In Cairns (Queensland), the AHB has been found in cavities such as letterboxes, walls of buildings, compost bins and on machinery. AHB nest and swarm sizes can range anywhere from 200 – 10,000 honey bees. A range of methods to assist with the detection of foraging bees, and for detecting nests and swarms of AHB are outlined below. Bee-lining is a systematic technique used to track foraging bees back to a nest. This technique is normally used when suspect bees have been detected foraging on a floral source. Bee-lining involves converting bees from the floral food source to an artificial food source (a feeding station). A floral scent (essential oil) is used in the artificial food source so that bees learn to associate that scent with a reward. The purpose of converting the bees is to encourage the foraging bee to return to, and recruit more bees to a specific foraging location. This enables you and others to track the flight path and subsequently locate the nest. Other bee species (including EHB and Tetragonula spp) will be attracted to the feeding station. Their presence on the feeding station should be discouraged as it may hamper the bee-lining process for AHB. Feeding stations should offer scented sugar syrup solution, an easy landing platform and something for the bees to stand on (eg sticks, rock, sand) so they don’t get sticky feet. The easier it is for bees to take up the sugar solution using their proboscis, the easier it is to convert them. A cover should be placed over the platform so that the syrup is shaded from sun and protected from rain. To make the sugar syrup solution, dissolve 1 kg of white sugar in 1.5 L of hot water, mix well and allow to cool. Add 1–2 drops of a floral essential oil to the side of the station (eg rose, lavender, citrus). Avoid using too much scent as it may deter the bees. Unused syrup can be stored in a plastic bottle, but will ferment if kept too long. Place the station in an unobstructed and open area. Ideally, the surrounding backdrop should be free of vegetation as this can make observation difficult. Observe whether the bees are foraging for pollen or nectar from the floral source being targeted. Bees collecting nectar are much easier to convert to an artificial food source. Laying on the ground and watching for bees against the sky may make it easier to determine the bee-line. To estimate the distance to the nest, time the return flight of a marked bee. Very roughly, a return time of 1 minute indicates a nest distance of ~100 m, 2 minutes of ~200 m etc. This is only an estimate, however, as a bee may spend varying times in the nest. The movement of bees (through reflection of the wing) is more noticeable when the sun is lower in the sky during the morning and afternoon. Good-quality binoculars or scopes are useful for studying tree hollows and detecting nests that may be too high to be seen clearly with the naked eye. Place a drop of the scent on the edge of the dish each time it is moved, to help the bees find the feeding station again. In the Cairns region, Tropical green ants (Oecophylla smaragdina) and other species were attracted to the feeding stations which subsequently discouraged bees from feeding and landing on the feeding station. You can apply products such as Tanglefoot or Tac-Gel to the stem of the feeding station to discourage the ants. Using a fine-mist spray bottle, dispense sugar syrup solution onto approximately one quarter of the floral source on which the bees are feeding. Place the feeding station close to this site so that the bees will become accustomed to the new, stronger scent of the station and are attracted to it. Repeat until the bees are successfully converted. Once five or more bees have returned to the station, it can be moved into an open area about 5 m away from the floral source. This will help to establish an initial bee-line that can be observed against an uncluttered skyline. To distinguish individual bees, place a coloured dot (using different colours of correction fluid) on the back of each bee while it is feeding. Move the feeding station slowly, in stages, in the direction of the observed flight path/bee-line. Allow a similar number of bees to feed from the station before moving it on again. In dense areas (rainforest and in congested urban areas), the station can be moved up to 10 m each time. In open fields (grass paddocks), the station can be moved 50 m–100 m each time, as long as you have correctly established the bee-line. If bees are lost from the station or reconvert to the floral source, repeat the process. Bees will generally fly in an ascending spiral as they leave the feeding station, until gaining a bearing towards the nest. Note a landmark (e.g. a tree) that can be seen in the direction of flight, or lay a ruler across the feeding station and align it with the line of flight and/or use a compass to mark the bearing. Once the same bees are returning regularly to the station they will start to take a direct route and recruit more bees. Continue to move the station in the direction of the flight path. In large open areas, two station sites can be used to triangulate the location of the nest. This method was used occasionally during the AHB T2M Program with varying degrees of success. Place a feeding station at Site A and record the flight path. Mark any bees feeding on the feeding station with a dot of correction fluid on the back of the bee. Once a number of bees are returning to the feeding station at Site A, move the feeding station to a new site (Site B), preferably 90 degrees from the initial flight path and at least 100 m away. Wait for the same marked bees to locate and adjust to the new site and record their new flight path. The point where these two bee-lines meet should indicate the site of the nest. Draw the two flight paths on a map of the area to pinpoint the nest. Honey bee colonies send out foraging worker bees to collect pollen and nectar for the nest. When a bee has found a good source of food or water it will return to the nest and recruit other bees to the source. Foraging bees will travel in a direct route back to the nest to deposit the food, making them easy to track. For this reason flowering plants are key food sources for bees. It is important to know local flowering plants and whether they provide nectar and/or pollen to foraging bees as these plants should be targeted. Utilise existing roads or tracks in the area of suspected AHB and plan a path to be walked for surveillance (the transect). Walk slowly along the transect, scanning all floral sources for the presence of bees. To increase the rate of AHB detection, stop at a flowering plant (or a patch of flowering plants/weeds) every 50–100 m and observe it for the presence of bees for 5–10 minutes. Carry out observations during the early morning and mid-to-late afternoon when bees are most active and when the weather is sunny with minimal wind. The timing of nectar flow may vary with the season and influence bee activity; local beekeepers should be able to provide advice. When you find honey bees foraging on a flowering plant, record the location (preferably using GPS coordinates), type of plant, time of day and date. Recording these details on printable maps will improve the efficiency of future surveillance. This will also create a catalogue and map of flowering plants in the area that are preferred by AHB. Collect at least one sample of the suspect bee using a butterfly net. Place it in a vial containing enough 70% ethanol solution to cover the bee/s so that it can be formally identified in a laboratory. Contact your local department of agriculture about where to send samples. If foraging bees are detected on specific plants (and are formally identified as AHB by a trained entomologist) use the bee-lining technique to locate the nest. 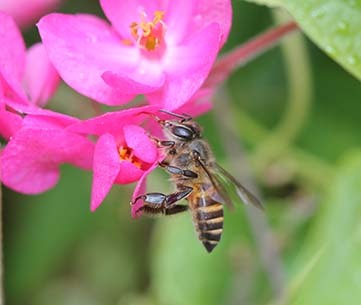 The Asian Honey Bee Transition to Management Program compiled a list of AHB-preferred floral sources in far-northern Queensland. This was used to help assist staff detect AHB nest locations of foraging bees. This list is available and may be used to help identify likely AHB floral sources in similar climates and urban areas. During the AHB T2M Program, a number of different trap designs and attractants were trialled with limited success. Until an effective attractant can be found and trap design can be greatly improved, floral observation is a much more time-and cost-effective method for determining AHB presence in a defined area. The most promising trap design trialled by Biosecurity Queensland was a simple, inverted-top bottle trap containing a mixture of sterilised/irradiated honey and water. The bees, attracted to the scent of honey, fly into the trap and drown in the liquid. Always remember that bee diseases, such as American foulbrood can be easily transmitted and spread by honey. For this reason, untreated honey should never be used to feed, attract or trap honey bees. Rainbow bee-eater (Merops ornatus) pellets provide an ideal tool for establishing the presence of AHB in an area. The rainbow bee-eater is distributed across most of mainland Australia. In northern Australia there are resident populations, but the birds in southern Australia migrate north during the winter months, resulting in larger populations in northern Australia between March and November. Rainbow bee-eaters eat a wide range of insects, though their diet mainly consists of bees and wasps. At night they congregate in large flocks and roost in trees. Roosting rainbow bee-eaters regurgitate non-digestible portions of their prey (such as bee wings) in the form of a pellet. These pellets fall to the ground, making it easy to collect for analysis. Since the AHB differs from the EHB by having a distal abscissa of vein M in the hind wing, these can be easily observed in the pellets. Birds can be found perched on powerlines and fences during the day if evening roosting sites are difficult to locate or access. The rainbow bee-eater has a distinctive, trilling call. Once you have identified this call you can track them to their roosting site. To do this, you will need to move around the area reasonably quickly, so riding a bicycle is a good idea. Watch for flocks of bee-eaters in the late afternoon, as they will begin grouping together in an area. They will then usually begin flying, in stages, towards their chosen roost. Listen for the bird calls and follow these small groups of birds until you reach the roosting site. Rainbow bee-eaters settle down quickly for the night once at the roosting site. Sometimes there is almost no indication that the chosen tree may be hosting several hundred birds, and frequently the owner of the property is unaware of the birds. Alternatively, ask local bird watching groups about the roosting sites of these birds, or use local media to encourage members of the community to report any known roosting locations. Locate a roosting site, spread a white linen sheet around the base of the identified tree and peg it out to catch the pellets. Collect pellets directly from the ground if the site is not suitable to spread a sheet, or if birds are seen regurgitating pellets during the day. Place samples in labelled vials and record the time, date, location and any other relevant details. Heavy rain will break down the pellets; keep them as dry as possible and do not use a tarpaulin (this will allow rainwater to pool, disintegrating any pellets). Do not refrigerate the pellets. The frequency of pellet collection is situation-dependent. Weekly collection will be necessary to confirm the presence of a new AHB incursion, whereas monthly pellet collection should suffice when trying to determine if an area is free of the pest bee. Laboratory diagnostics will be required to determine if rainbow bee-eaters have been feeding on AHB in the area. Contact your local department of agriculture about sending samples through for diagnostics. The presence of AHB cannot be determined without analysis in the laboratory. The AHB can spread naturally through swarming and absconding. AHB colonies can produce up to 10 swarms per year and have been reported to travel up to 10 km from the original colony; however they most commonly swarm within 1 km of the original colony. Reproduction, nest disturbances, pest and disease pressure or even a lack of nectar or pollen can cause the AHB to swarm or abscond. The AHB is a proven hitchhiker on a variety of modes of transport and can spread over large distances into new areas on boats, trains, trucks and on shipping cargo. In the Cairns region, AHB was found to inhabit highly disturbed areas (rural, cropping, grazing paddocks, grazing land with natural vegetation), human settlements (residential, commercial, industrial, gardens and semi-natural land) and forests (rainforests, bushland, mangrove and intertidal zones). Over 90 per cent of the AHB nests detected were located in disturbed habitats and agricultural land. The majority of the nests located were established in man-made structures, such as permanent buildings and their fixtures; residential backyard structures; miscellaneous objects and structures; land transport vehicles, parts or machinery; marine transport vehicles and marine structures. The remaining nests were built in natural structures including trees, tree stumps, pot plants, logs and fallen palm fronds. AHB nest height ranged from 0 m (in the ground) to over 40 m, with the majority of the nests occurring around 2–3 m above the ground. 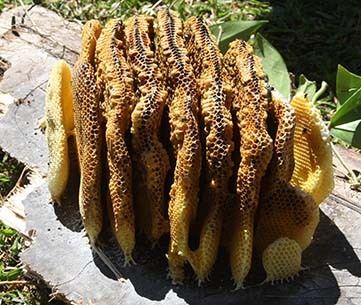 Average nest size was around 2000 bees, with around 3–4 combs. AHB swarms were detected in a range of landscapes, most of which included highly disturbed areas. Specifically, and in order from most frequently detected to least frequently detected, these landscapes were residential, commercial, industrial, rural, cropping, parkland, gardens and semi-natural areas, rainforest, bushland and grazing paddocks. Over half of the A. cerana swarms were located in non-natural structures including permanent buildings and their fixtures; residential backyard structures; land transport vehicles, parts or machinery; marine transport vehicles; marine structures; and miscellaneous objects and structures. The remaining swarms were found on natural structures including trees, shrubs, fallen palm fronds and throughout sugar cane paddocks. Although swarm height varied with the environment that it was in, the average height for a swarm of AHB was between 2-3 m. Average AHB swarm size was around 1700 bees. The AHB originated in Java (Indonesia) and has since spread throughout Irian Jaya, Papua New Guinea and the Solomon Islands. In 2007 the AHB was detected in the Cairns region of Queensland and has since been found at Port Douglas (north), Mareeba (east) and as far south as Innisfail. It has not been found outside this region in Australia. Currently, the only method of management is to find the AHB nest and destroy it. Information on how to destroy nests and swarms of AHB is contained below. For videos and fact sheets of these methods, go to the Additional information and Videos tabs. If you find, or think you have found the AHB it should to be reported to your local department of agriculture immediately. 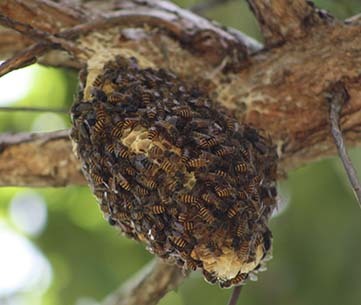 Bee swarms and nests can be found in a variety of environments. Each will behave differently when approached and requires a slightly different method of treatment. Situational site risk assessments are essential to reduce potential hazards to buildings and personnel. It is important to ensure that the product and technique you employ is suitable for the situation, action is taken to eliminate potential bee escape routes from a nesting cavity and that additional products are available on standby. When attempting to destroy bees, a minimum of two people should be present to ensure each others safety, keep onlookers at bay and provide help in the case of emergency. Inexperienced bee handlers should engage the services of a local beekeeper to assist with identification. Similarly, a commercial pest controller could also be involved to assist with the destruction of bee swarms or nests. It is always recommended to seek additional specialised assistance if the swarm or nest is too high or unsafe to reach, roofing panels need to be removed, the swarm or nest is surrounding electrical wires or where there are regular pedestrians and vehicular traffic. It is recommended that you refer to the relevant legislation applicable to your state regarding the use of certain insecticides. Insecticides must always be used in strict accordance with the approved label. Approval must always be sought from the Australian Pesticides and Veterinary Medicines Authority (APVMA) where products are to be used for purposes other than specified on the label. All personnel involved in detecting and destroying bees should wear appropriate protective clothing as listed in the Material Safety Data Sheet (MSDS) for the product(s) used. The minimum protective clothing recommended includes an apiarist veil, elbow-length gloves, full body disposable overalls, sturdy enclosed footwear, a dust mask and safety eye wear. You can buy personal protective equipment from suppliers listed under ‘apiarist supplies’ or ‘beekeeping supplies’ in the phone directory or online. When working around bees, keep well-maintained medical kits that have the capacity to treat severe allergic reactions (anaphylaxis), within reach. This product is commonly found in most households for the control of flies, mosquitoes and other house-dwelling insects. It is readily available for purchase in many convenience, grocery and hardware stores. This product is a fast-acting insecticide liquid spray (often called ‘wasp spray’) that is intended to control a variety of flying and crawling insects, including feral bees. This product has a few distinct advantages, namely: it is safe to use in and around areas with electrical wires and equipment (eg wall cavities); it can be sprayed upwards at a 15 degree angle; and it can be sprayed over distances of up to 3.0 to 4.5 m. It is publicly available for purchase in most shops that stock industrial supplies. This is used to control a variety of insects, including feral honey bees. It is a fine, lightweight and residual product (due to its hydrophobic properties), with a heightened capacity to penetrate inaccessible spaces, making it ideal for inaccessible spaces such as wall cavities and block wall crevices. This chemical is readily available to the public in many hardware stores or professional pest control chemical supply stores. Flying insect spray and a large plastic zip lock or garbage bag is the most effective technique to contain and kill an accessible swarm. Always remember to dress in the appropriate protective clothing when attempting to destroy an AHB swarm. Assess the position of the swarm and its attachment to the structure. Taking care not to disturb the bees, remove any objects that may hamper the bag being placed around the bee mass. Check that the bag is large enough to hold all of the bees, then in one slow, relaxed, smooth motion enclose the bees with the bag and bring your hands together at the top to seal them in. Gently shake the swarm mass until it detaches and drops into the bag. Tie the bag and place it inside another bag to ensure that no bees escape. 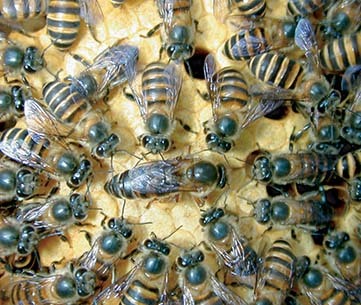 If unsuccessful in capturing the majority of the swarm and the queen, repeat the process when the bees have resettled. Spray any flying bees and the area where the swarm was hanging to discourage any uncaptured bees from returning (note that a swarm of bees requires a queen to survive and if removed, remaining bees will die). Once capture is complete, place the bag containing the swarm of bees into a freezer or pierce a small hole in the bag and spray insecticide through it. Either of these will kill the bees. If you cannot place a bag around the swarm of bees, cover the whole swarm and structure that it is clinging to with a large sheet. Bees will naturally try to escape by flying upwards, so create a teepee (by pulling up the middle of the sheet, but without lifting the sheet off the ground) to trap the bees. Then spray aerosol chemical under the edges of the sheet to kill the swarm; have a number of people help with this. High-output liquid insect killer can be used to effectively kill swarms that are at an unreachable height or near electrical wiring, or for situations where bagging or using a sheet is not suitable. The aerosol can be attached to an extension pole applicator to increase the reach of the liquid jet. The chemical should be sprayed onto the bees, starting at the top of the mass and working your way down as quickly as possible while ensuring plenty of chemical is applied. Depending on the size of the swarm, you can use an aerosol can in each hand for greater coverage. The bees may become disturbed and start dispersing prior to destruction or as destruction begins. If this occurs, the swarm of flying bees can be tracked until they resettle at another location, often nearby. Occasionally swarms must be tracked over hundreds of metres in complicated environments, so additional help is recommended. Once bees have resettled, choose the most appropriate technique and recommence destruction. Note that bees may disperse to a new nesting cavity. If the swarm is observed entering a cavity, use the following methods for nest destruction. After destroying a swarm of bees (especially for suspect new incursions), it is vital to confirm that the queen bee has been captured. If you cannot find the queen amongst the dead bees, it is possible she may have escaped with enough worker bees to produce a viable colony elsewhere. Dead bees should be removed from the cavity, correctly labelled and retained for laboratory analysis. It is critical to always inspect AHB swarms for possible exotic parasitic mites. For more information about surveillance methods, such as alcohol washing, click here. Aerosol sprays and permethrin dust are suitable for destroying nests of AHB. Decide which chemical product will best suit the situation. Always remember to dress in the appropriate protective clothing when attempting to destroy an AHB nest. The amount of chemical required to kill a nest of bees depends on the nest size and cavity location. Occasionally, multiple products may be required to successfully destroy a nest. Examine the nest entrance and check for possible escape routes. Plug all of these holes with wet paper towel (or another suitable material). If the main nest entrance is large and there is potential for bees to escape through it during destruction, either plug the main hole and leave a small entry point, or have several people available to spray the main entrance at once. If you cannot see the nest inside the cavity, listen for the high-pitched hum of the bee colony to locate it (the inability to see a nest is called a blind kill). Dispense the chemical into the nest entrance, covering as much area as possible within the cavity. Try to apply the chemical directly onto the comb and bees. Seal the main entrance, after applying enough chemical, and leave it for a few minutes. The fumes from the chemical should circulate within the cavity and kill the trapped bees. Spray any foraging bees that try to return to the nest. Listen for changes in sound from the nest; as the nest of bees dies, the high-pitched hum will decrease to a very low and dull hum. When the audible humming sound ceases, the nest can be presumed dead. Always ensure that the nest remains plugged for as long as possible to avoid off-target impacts. To ensure the success of the kill, check the nesting site 24 hours after destruction. When permethrin dust needs to diffuse around corners (eg in wall cavities), an electrical pump applicator can be used to spread chemical further, making it more likely to reach bees and comb deep within cavities. To safely destroy a nest located near electrical equipment use high-output liquid insect killer (eg a nest within a fuse or metre box). The high-output ‘jet’ spray applies chemical to targets up to 4.5 m away, in a ‘knock down’ effect. Two or more people, and several aerosol cans, may be needed for adequate chemical coverage of large nests. Where possible, spray nests late in the afternoon or very early in the morning, when the nests are less active and most of the foraging bees are present. If possible, dead bees and combs should be removed from the cavity, correctly labelled and retained for laboratory analysis. It is critical to always inspect AHB nests for possible exotic parasitic mites. For more information about surveillance methods, such as alcohol washing, click here. Additional information about this pest are listed below. A series of reports from the Asian Honey bee Transition to Management Program are also available. The video below has been produced to help provide information about how to destroy nests or swarms of AHB.